Most robotic hands are pretty clumsy when it comes to handling delicate matters such as picking up a soft fruit/vegetable like the tomato, or even gleaning a coin from the floor (other than using a magnet). We often see these robotic appendages come in the form of a pincer like those Lego people or in some weird shape that would never be able to live up as a practical solution to that of a human hand. 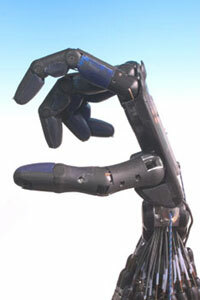 All that is changed forever with the Shadow Robot Hand from Shadow Robot Company. This unique piece of technology targets mainly the media, advertising, and public relations industries, while it is also useful for virtually any other job that you need a hand with (no pun intended). This dextrous robotic hand is capable of two dozen movements and is touted to be the most advanced commercial robot hand in the world, boasting the closest similiarities to that of a humand hand. The 24 movements offers direct mapping from a human to the Shadow Robot Hand itself, although we’re not sure if it is dextrous enough to pump out 80 words per minute on the keyboard. It is capable of holding up delicate objects like a tomato, using just the right amount of pressure without squashing it. With integrated sensing and position control, you get precise movement from off-board computers, or can even integrate it into your existing robot platform. There are a total of 36 Air Muscles within that make it move. These air reservoirs are filled by a foot pump. You can also fit touch sensors on the fingertips, offering sufficient sensitivity to detect objects as small as a single coin. Looks interesting. It looks like a cool step forward. I agree about the typing though 🙂 It would be interesting to see it it could be programmed to type.